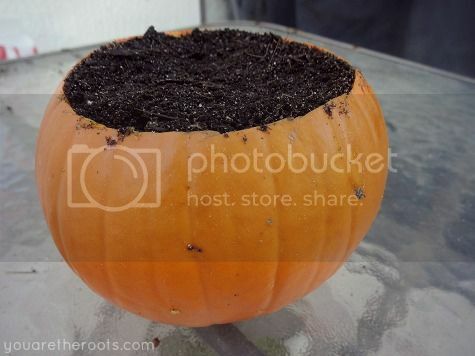 Allie of Little Mouse's House had posted a way cute tutorial in which she made a planter out of a pumpkin. 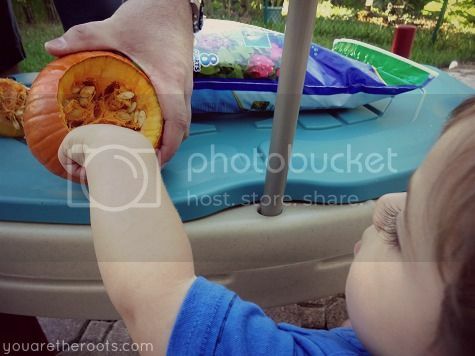 As we scrolled past the display of pumpkins at the grocery store this past Sunday, the tutorial popped into my mind and I knew I wanted to do this activity with Ethan, too! 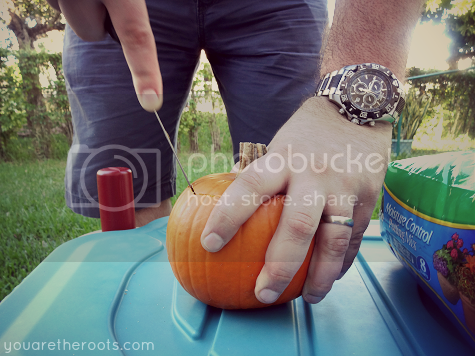 We selected a little pie pumpkin and got to work! 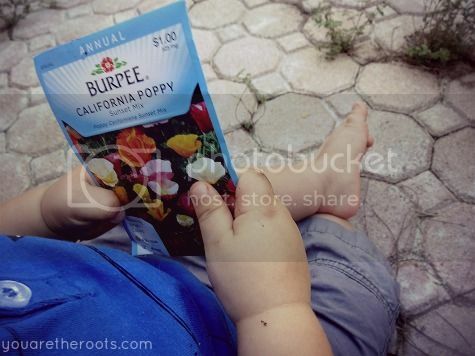 Ethan and my husband picked the seed packet out during an afternoon trip to Home Depot. I followed the directions on the back of the packet and am hoping something sprouts soon! I can. not. handle how cute your child is. 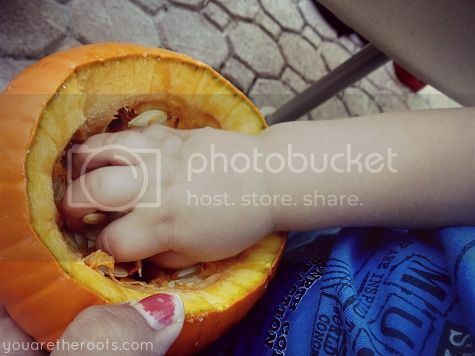 I also like this pumpkin idea.... but I can't stop mushing over Ethan. Haha, thank you! He's lucky he's cute! ;) Maybe he'll see you in November! I love pumpkin crafts! isn't this time of year wonderful! 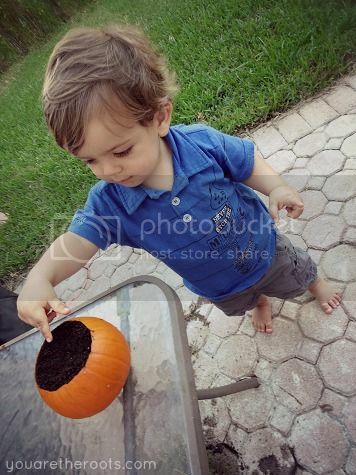 Ethan is too cute, i'm sure he is eager to watch the flowers bloom! I always loved this time of the year and the holidays but, man, they're SO much more fun with a little one! I'm so nervous nothing will sprout for us, either! I'm not much of a gardener, haha! This was such a cute idea. Thanks again for sharing! Cool idea! We've got a couple pumpkins that aren't going to get carved. May try this out! Awesome! I can't wait to hear how it goes! That is such a cute idea! 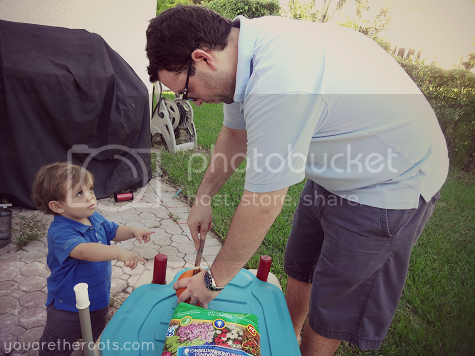 I have to say that the way you documented the planter and Ethan's little hands look all kinds of adorables! PS-I have a black thumb...although I just acquired some plants as funny party favors. Let's hope they last a week! I have a black thumb, too! I'm trying so hard to practice because I'm determined to plant a garden in our backyard when it cools down a little more. Eek. It didn't go so well last time, haha! What a neat idea! 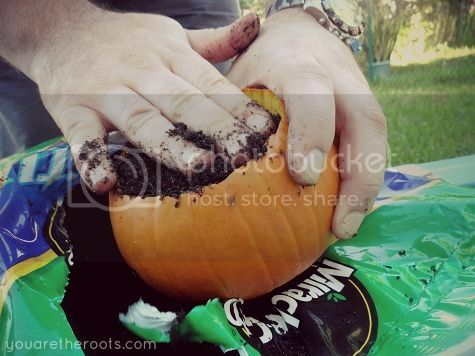 I never even thought about using a pumpkin as a planter. Genius! And oh so cute. Right?! Allie had such a great idea! Such a fun project!